Advantages: Model features a unique and striking looking aircraft; styrene parts are accurately molded, with high quality and finely recessed lines; option to build big-mouth viper is much appreciated; good ordnance compliment, especially the targeting pods; excellent quality resin parts with great fit and helpful alignment features; inclusion of two pilot figures including two helmet types. The kit is a representation of the Greek Air Force F-16D Block 52+ aircraft. The F-16 has a long and venerable history that cannot be explained in any concise way. Therefore, I will limit my description to this particular export-version F-16D. Certainly the most striking feature of the F-16D Block 52+ is the prominent dorsal spine behind the canopy that contains additional warfare electronics and countermeasures. At first glance, it appears that all dorsal-spined F-16Ds are the same. However, closer examination will reveal small differences in the features of the dorsal spine and other areas of the aircraft for each different air force. Apparently these new aircraft are being closely tailored to the particular needs of each nationality. Another striking feature is the presence of conformal fuel tanks that sit above the aircraft’s fuselage. 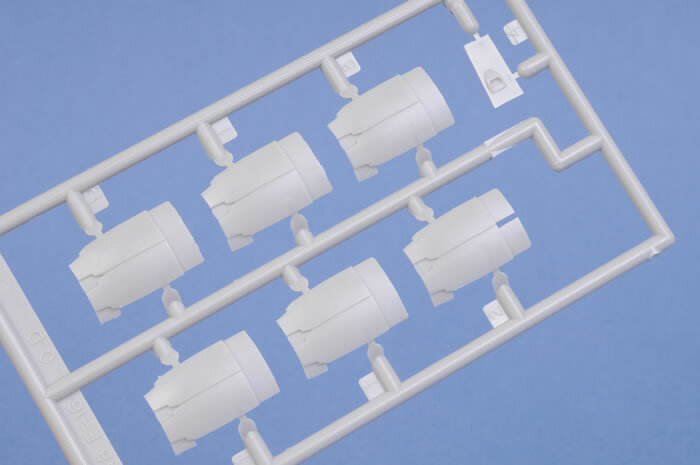 These fuel tanks dramatically improve range, and can also increase payload capacity by freeing up two pylons that would otherwise carry drop tanks. Reported these conformal tanks have minimal impact of flight performance. 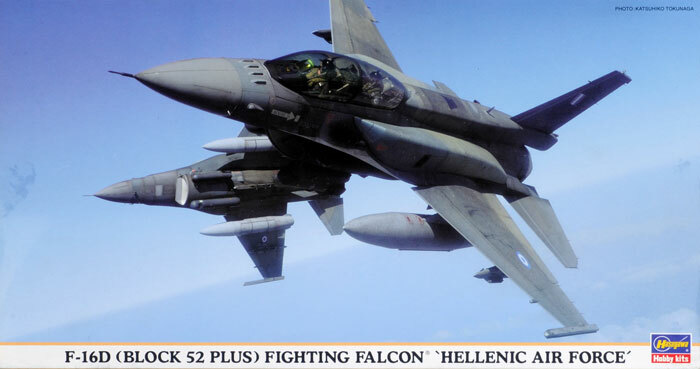 The aircraft featured in this kit is a representation of the F-16Ds sold to Greece through the Peace Xenia III and IV agreements. Decals represent service with the 115 CW, 340 Mira, Greek Air Force (nos. 601, 610, 617, and 619). These aircraft are powered by Pratt & Whitney F-100-PW-229 engines, as indicated by the "2" in "Block 52". Hasegawa’s latest 1/48 scale F-16 release (June 2008) came to me as a very pleasant surprise as I was casually scanning the racks at my LHS. 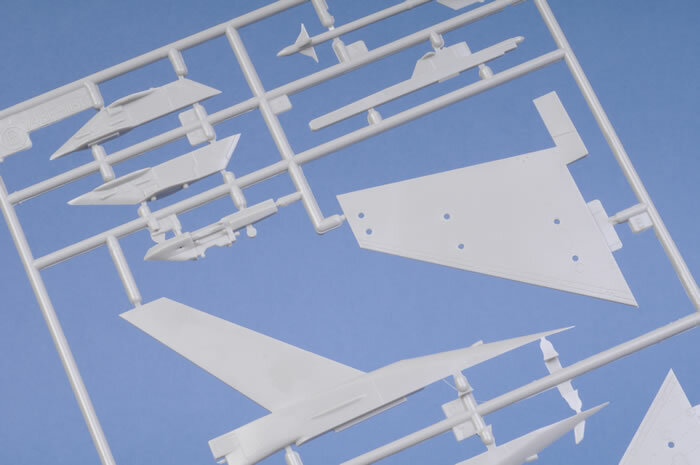 The limited-reissue of the 1/48 Hasegawa F-16D kit (#09803) has additional new parts to build a Block 52+ Fighting Falcon of the Greek Air Force. This kit seems to be a follow-up to the infamous IDF “Brakeet” F-16D kit that was so highly in demand a few years ago. Based on the dwindling availability of this Hellenic version at online stores, I suspect this kit will also experience a high demand and will be sold out in short order. 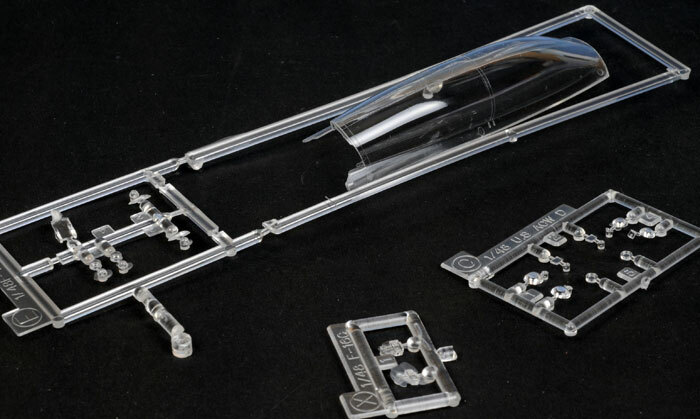 The kit is essentially a hybrid of Hasegawa’s old F-16B/D kit and some newly added resin parts for an “in-the-box” Block 52+ conversion. 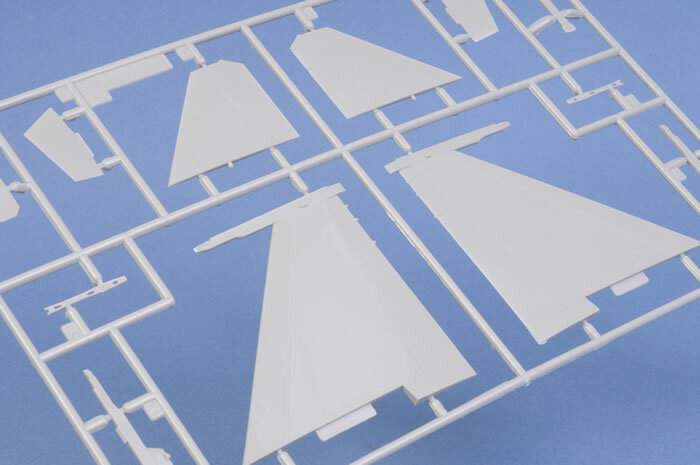 As before, the old Hasegawa F-16 parts are molded with excellent quality, finely recessed panel lines, and lots of accurate detail. There are many reviews available for the original 1/48 Hasegawa F-16 kits, so I will leave it up to the reader to look into them if desired. I should note that some parts in my kit have minor flashing at the edges, but there isn’t anything that can’t be trimmed or sanded away very easily. This kit comes with a LOT of plastic. 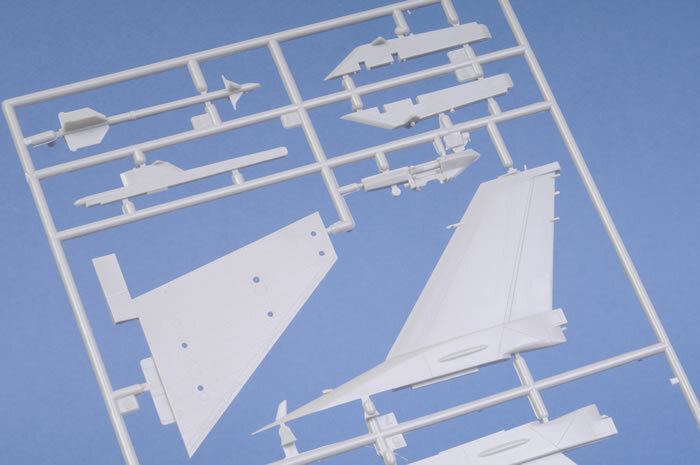 There are over 150 parts molded on 8 gray-plastic sprues and 2 clear-plastic sprues. 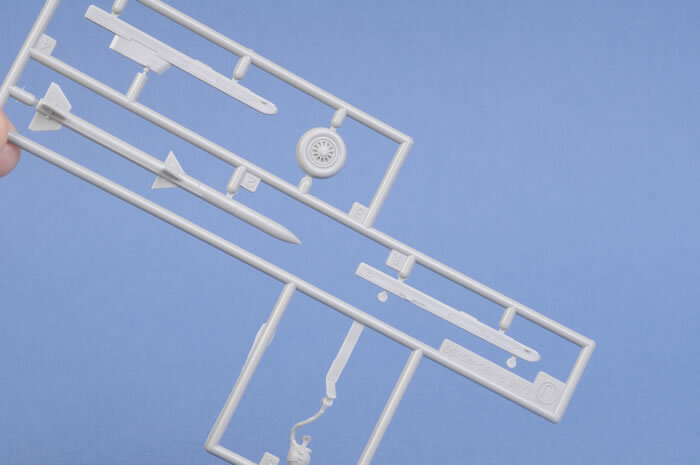 There are 16 resin parts for the Block 52+ conversion, along with the Greek Air Force decals. Lastly there is a detailed instruction manual that seems to outline the conversion process well. 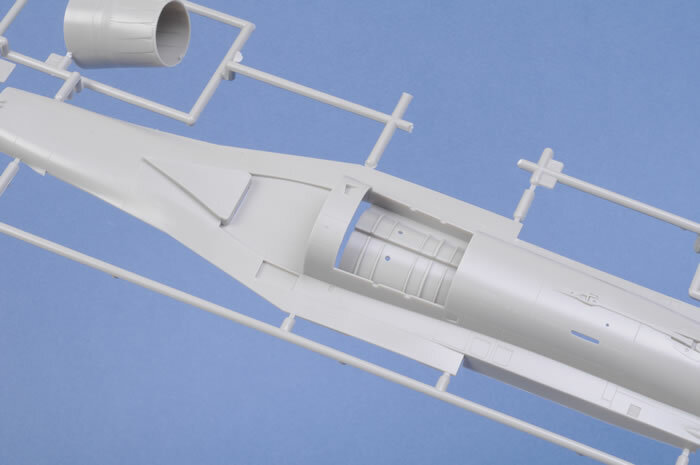 The kit features a decent compliment of ordnance which includes two AIM-120s, two AIM-9s, two standard wing drop-tanks, one centerline drop-tank, and a personal cargo transport pod. 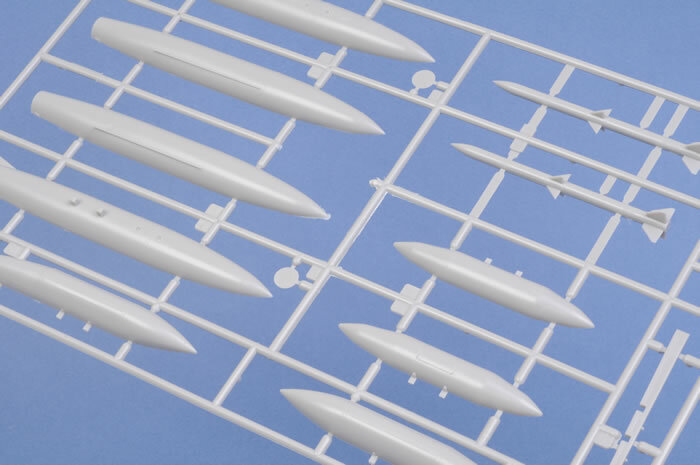 The kit allows the option to have either AIM-9 or AIM-120 launch rails on the wing tips. 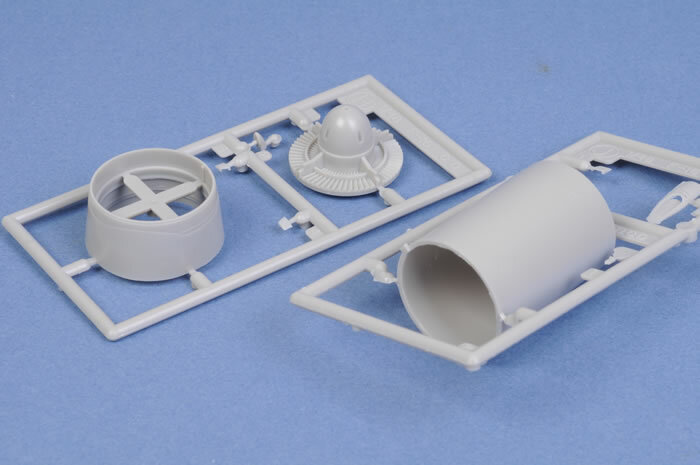 Lastly, there is also included an AN/AAQ-13 navigation pod and an AN/AAQ-14 targeting pod which both are molded very nicely and seem to come from Hasegawa’s 1/48 Weapon Set D. Unfortunately, no air-to-ground ordnance is included to go with the targeting pod. 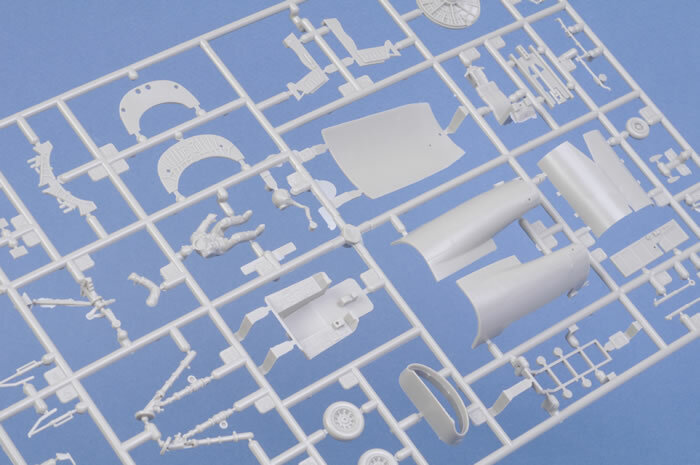 The most surprising inclusion in this kit are the various additional parts necessary to build a “big-mouth” Block 50+ viper powered by a General Electric F110-GE-129 engine. These extra parts include a large mouth intake, a GE F110 exhaust tail cone and intake compressor fan, and even bulged main gear doors. The instruction manual lists these parts as “not needed”, but they have obvious been intentionally included to improve the versatility of the kit. It is strange that Hasegawa does not mention this on the box. This seems to open the possibility of building an Israeli F-16D Block 40K (another dorsal-spined viper), but I have not looked into how much modification would be required given the included resin parts. 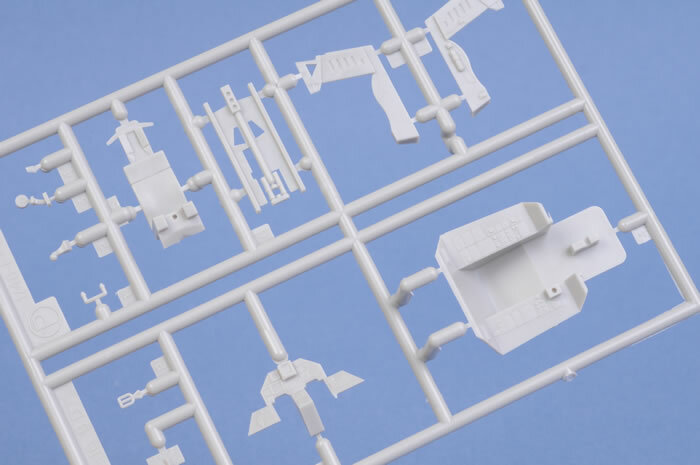 If nothing else, these parts certainly allow the modeler to build a variety of Block 40/50 F-16Ds, or even earlier F-16Bs since all of Hasegawa's other two-seater F-16 kits have been discontinued for some time. Those resin parts should be very easy to sell if you don’t want them. While we are on the topic of intakes, I would like to mention that I’m not crazy about Hasegawa’s four-piece design for the engine intake (both small & large mouth). It results two large seams inside the intake that are difficult to putty and sand. Perhaps this is easy for a more-skilled modeler, but I struggled when I built my Hasegawa F-16C of similar design. I eventually relented and bought a Cutting Edge Seamless Sucker resin intake that was much easier to install, and it looked great. It’s molded in white resin which means you don’t even have to paint the interior. I highly recommended it as an upgrade to this kit, if you can find one. However, if you’re planning to use a FOD cover on the engine inlet you should be perfectly fine with the included parts. My biggest disappointments with this kit are all surrounding the canopy. First of all, the canopy in my kit was not individually bagged and it has been scuffed and scratched in a dozen places where other parts have rubbed against it. This could have easily been prevented, but now I will have to polish out all of these scratches. Secondly the canopy mold leaves an annoying seam lengthwise down the middle of the canopy. This is a long-standing problem with the old Hasegawa F-16 kits. Granted, this is fixable with some mild-sanding (2000 grit), followed by rubbing with a polishing compound, then followed by applications of Future. However, this is a challenging and time-consuming effort that really shouldn’t be necessary just to have a seam-free canopy. 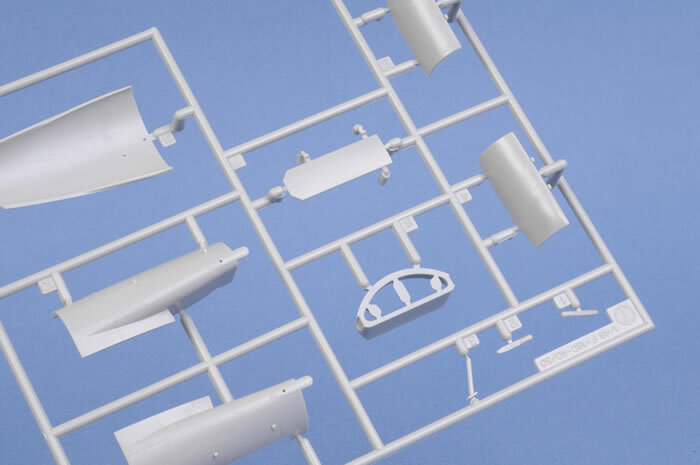 I wish that Hasegawa would include a vacuformed canopy with their resin parts, since nobody anywhere seems to be making one (hint hint... are you reading this Falcon Co.?). 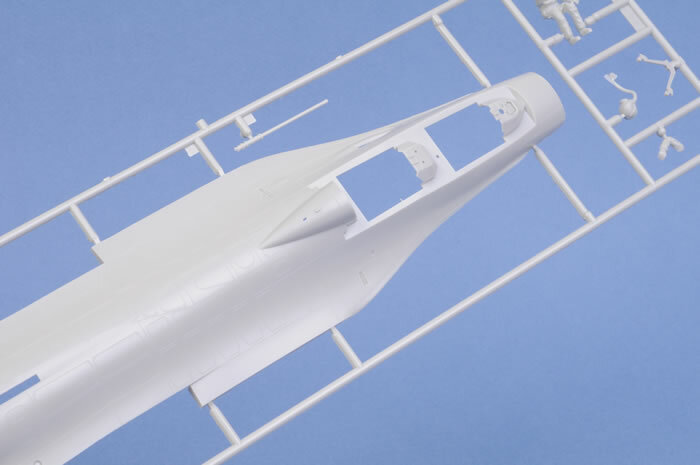 For all my gripes, allow me to say that Hasegawa’s canopy is molded to a very accurate shape, and that it fits the fuselage perfectly in the closed position, which is very nice. One last bit of information for the potential buyer: Hasegawa chose to only include the clear canopy for this boxing, and not the additional smoked canopy that used to come with the F-16 kits. The resin parts are all nicely molded with fine details. 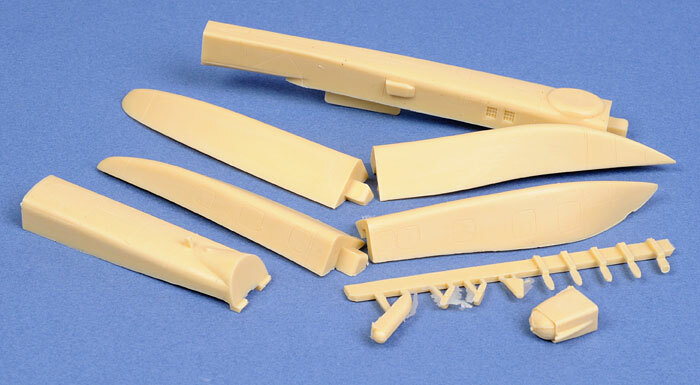 The conformal fuel tanks (CFTs) and the spine are molded in segments, but they seem to assemble easily and I doubt that they will need any putty at the joints. The spine has alignment features which make installation a real breeze. 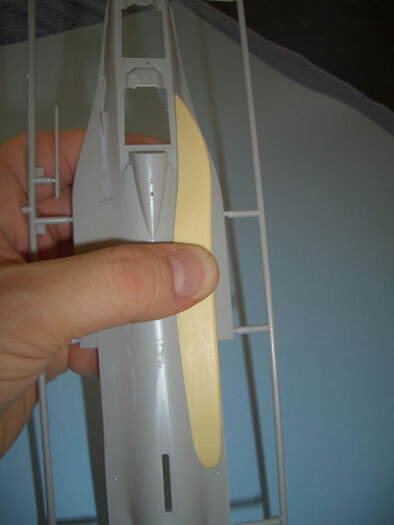 Additionally, both the CFTs and the spine have an impressively flawless contour fit to the fuselage. When the CFTs are fit to the fuselage there is a very-thin even-spaced gap around the entire perimeter of the interface. I expect that this gap will look very representative of the fit of real-life CFTs on the F-16. 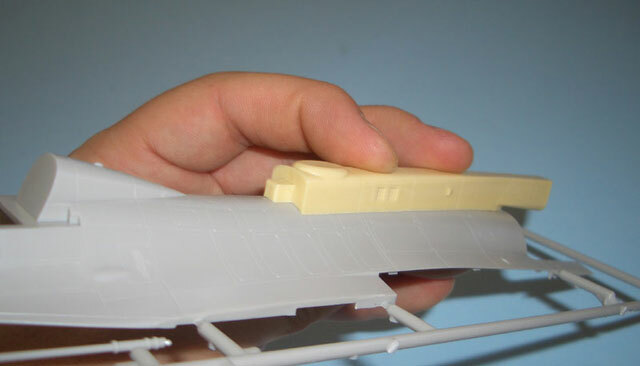 I doubt that any putty will be needed between the resin parts and the fuselage. I have not test fit any of the smaller resin parts, but they are visibly molded with nice detail. They include the parachute pack or the end of the spine, four IFF “bird slicer” antennas, ECM bumps for the side of the engine intake, and a couple others I have not identified. The cockpit once again comprises standard Hasegawa parts. Details here are good, but not great. A Black-Box resin cockpit would probably be the biggest bang-for-the buck upgrade for this model. 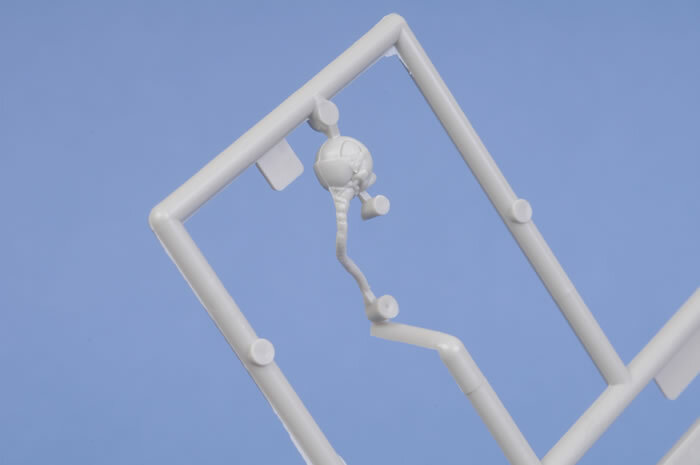 Note that the kit comes with two nicely-molded pilot figures, each with two different helmet options. The kit is retailing for about $65, which at first seems very expensive. However, when you break it down the price tag is actually quite reasonable considering that the resin parts alone would cost $30 from an aftermarket vendor. Meanwhile, the out-of-production Hasegawa F-16D regularly sells for around $40 on the used market.